The workstation market is on the brink of extinction, under the pressure of software tools ─ or at least that's what you read everywhere. 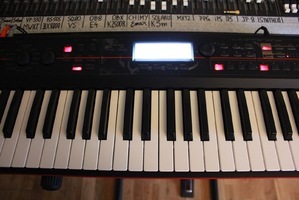 Yet, Korg has been successfully developing a whole range of this type of synth, ever since the M1 came out in 1988. Today ─ more than ever ─ the Japanese company is the leader in the market, a position that only Yamaha and Kurzweil seem to be able to dispute, since Roland still needs to get back in the saddle. In 2011, Kronos marked the history of synthesis with unprecedented power. 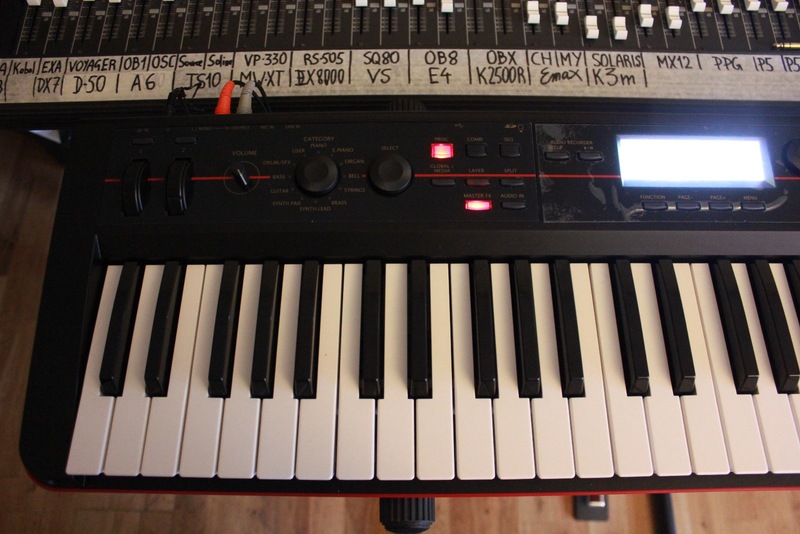 Korg next released an X version, with a newer motherboard and more memory. The product range is right now the subject of an evolution (OS 2.1), including improved organ modeling. In 2012, Krome redefined the entry-level range for workstations with a huge PCM memory for a hardware device, a powerful sequencer, effects by the dozen and a very good usability, making it an excellent value for money. We were waiting for a new mid-range product to see the light of day in 2013, but, instead, Kross came along breaking a new price barrier to redefine entry-level. Let's see if it has what it takes to make it a new standard among workstations. 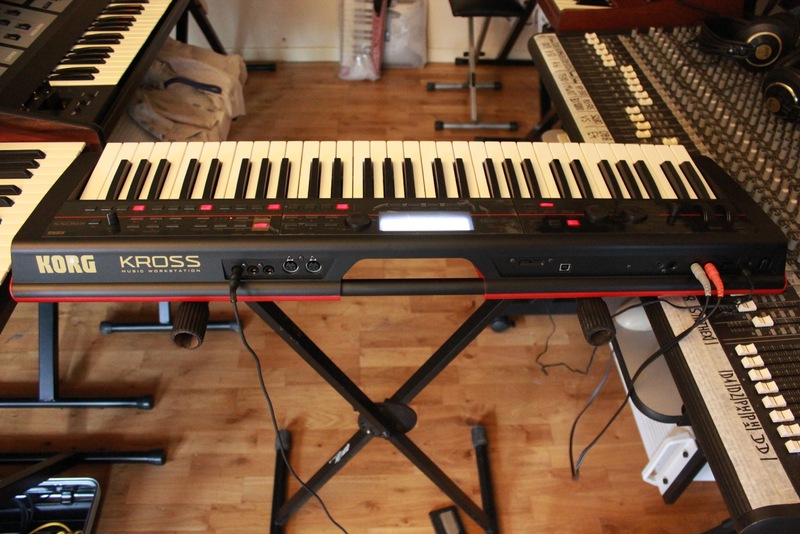 Kross is available in two models: 61 light keys or 88 weighted keys. We tested the 61-key version, which features a somewhat sticky keyboard that is only velocity sensitive. The Kross is entirely made out of plastic (which was expected, given its low price) in two colors: black on top and red on the bottom. The construction is all right: the front panel is very rugged, the three big encoders and two knobs are tightly anchored, the buttons are firm, the two wheels (pitch and modulation) are perfectly on axis, and the connections are screwed onto the rear panel. It goes to show that the construction doesn't necessarily have to be compromised, even on entry-level products, thank you! For the sake of compactness, Korg included conventional mod and pitch wheels, instead of a joystick, which are placed above the keyboard, right above the lowest C# and D#. 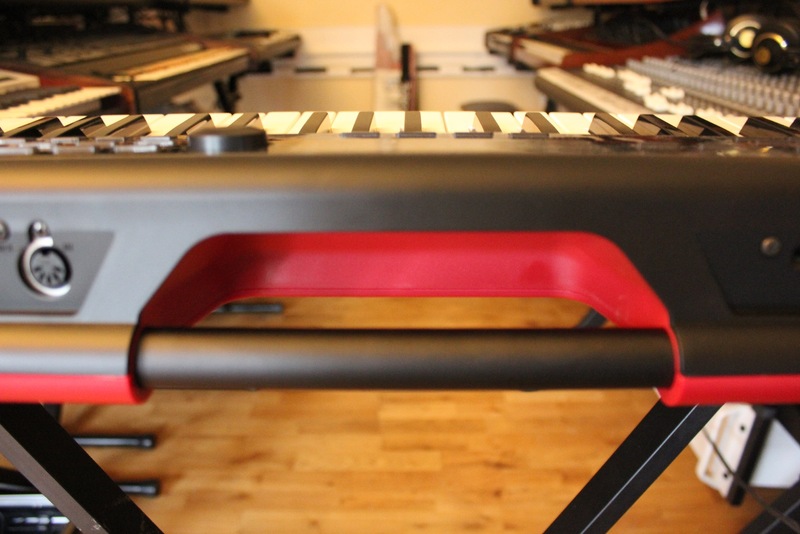 The 88-key model features the more standard left-of-the-keyboard position for the wheels, which is too bad, because the above-the-keyboard placement would have reduced the total width and made the model even easier to transport. The mechanism of the "NH" keyboard surely has something to do with it! The transportability of the keyboard is not only highlighted by its impressive 9.5 lbs. weight (27.3 lbs for the 88-key model), but also by the built-in metal carry handle (see the picture) and the compartment on the bottom of the unit, which can host six AA batteries, providing four to five hours of battery life, depending on the type of batteries used. Except for the mini-jack headphone output on the front left, all connections are on the rear panel, which features nothing extraordinary: three connectors for pedals (sustain with half-damper, continuous, switch), MIDI IN/Out, SD Card connector (supports 2Gb to 32Gb SD/SDHC cards, for programs and audio), USB port (MIDI over USB), line input (in TRS mini-jack format), mic audio input (1/4" TS jack), left and right stereo audio outputs (1/4" TS jacks), and a power supply section (connector for the included external 9V power supply, a power switch and a cable hook, better than a Solaris!). 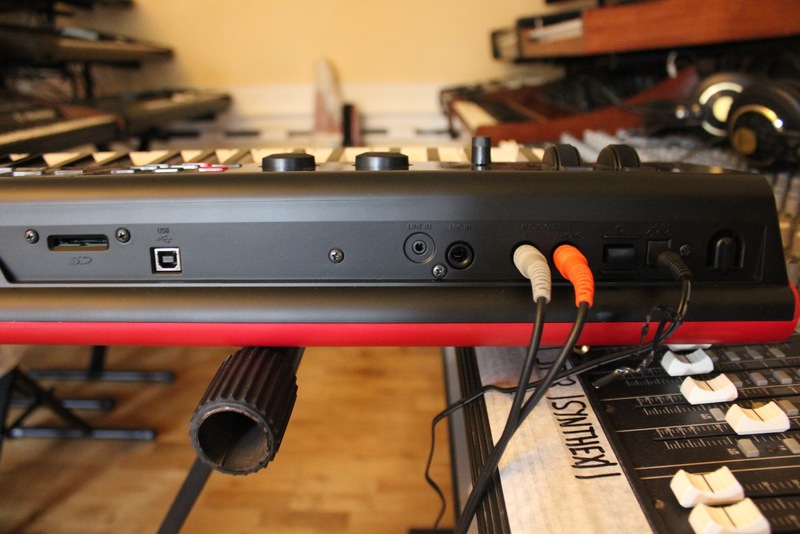 In case it wasn't clear, we really appreciate Korg's decision to place all connections on the rear panel. The front panel somewhat recalls old workstations with few direct controls: Nevertheless, there are operation mode buttons (programs, combinations, sequences, global/media, audio), a navigation section around the 240 x 64 pixel monochrome LCD (non touch-screen) with adjustable contrast, transport controls with tempo, and a row of 16 buttons to recall favorites or program the step sequencer, which we will address later on. To simplify sound selection, the Kross has two dials, one for the categories (12 in total, including one for user programs) and one to make selections within the current category. Likewise, there are buttons to immediately create a layer or a split based on the program mode, or even to launch a drum track or arpeggios, or both, in real time. Faithful to the long-standing Korg tradition, two assignable keys (SW1/SW2) overhang the wheels to modulate sound in real time. Navigation is done via menus and linked pages, which at times seem endless. The four buttons located below the screen allow you to scroll or select the pages, together with four cursor buttons and a data encoder. Editing is a bit cumbersome, especially as the Kross does not spare synthesis parameters, far from it, actually. 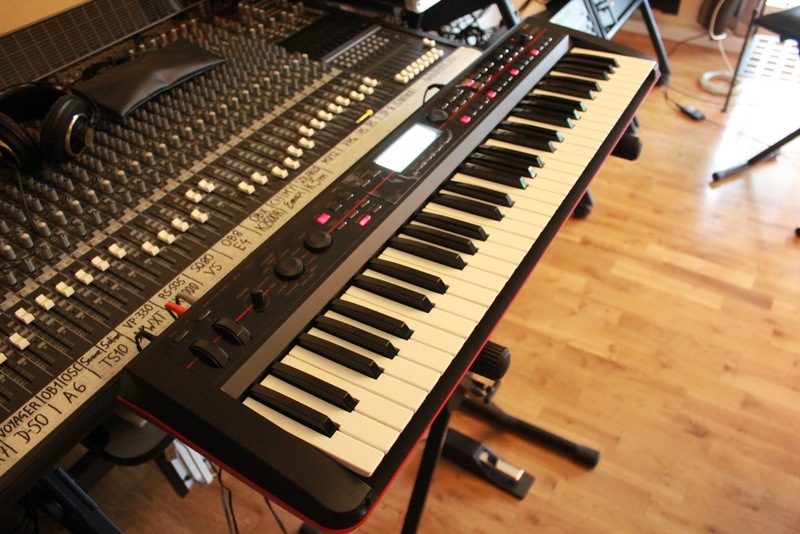 To simplify things, the OS tries to make things right: display of certain parameters as drop-down lists, graphic representation of envelope curves, LFO or sample layers, etc., and an online video tutorial to get you familiar with the workstation. A function allows you to save four banks of your 16 favorite programs, combinations or audio sequences for immediate recall, which is ideal live. 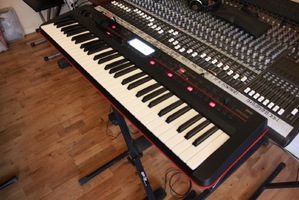 The Kross is capable of generating 80-voices of polyphony with one oscillator (40 with two) on 16 multi-timbral channels. It draws its sounds from a 112 MB ROM of PCM samples (421 multi-samples including six stereo and 890 percussion samples, including 49 stereo). 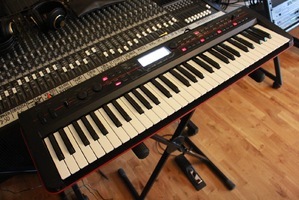 It's not much for current standards, especially those of Korg's latest workstations (3.8 GB for the Krome, for example). Particularly as the six stereo multi-samples are, in fact, 3+1 layers of a single piano, a group of strings and a group of brasses. But, anyway, these multi-samples are fairly good in relation to the memory used. As for the acoustic piano specific to Kross (derived from Kronos / Krome German), there are three layers to which an additional layer is added, simulating the sympathetic resonance produced when the sustain pedal is pressed down. The few electric pianos available are satisfying, most of which have several layers (three, in general). The organ collection is generous, but not new. And then you have the bells, which have an incredible sparkle, thanks to 16 bit/48 kHz sampling. As on any good workstation, you have wind instruments (pretty good overall), strings (different sections including a large stereo one and solo instruments that sound pretty good), vocal sounds (classical, pop, jazz), basses (with an excellent presence and punch), guitars (average), and percussion sounds (all right, with a special commendation to the stereo jazz kit by the jury). The main general criticism to this series of acoustic samples is the lack of dynamic layers ─ the limited memory is evident. That's partly what differentiates the Kross from the Krome. The synthetic programs are plentiful and excellent, making Kross really shine when it comes to sombre pads and luxurious progressive textures, a real strength indeed. 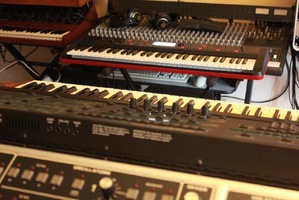 You can also find very musical key Mellotron samples (strings, vocal, flutes). All in all, you have 640 programs, 384 combinations and 48 drum kits, which can be overwritten, the majority being factory pre-loaded. The structure of Kross won't throw off people familiar with the brand, except for several minor details: In Program mode, you have a sound, an arpeggiator, a drum track, a step sequencer, and seven multi-effects at your disposal. In Combination and Sequence mode you have 16 independent sounds, two arpeggiators, one drum track, one step sequencer, and seven multi-effects. An audio recorder completes the lot. Let's start with the Program mode, very similar to the one on Krome, but less powerful. It uses one or two oscillators with four velocity zones (each of which can be assigned a mono or stereo multi-sample) or a percussion kit, which can be edited in Global mode (each key can be assigned from one to four layers of mono or stereo samples). Those of you in a hurry can adjust certain synthesis parameters beforehand (filter, envelopes), as well as the audio input. Those into deep parameter diving will be delighted with the synthesis depth at hand, because the Kross features all modules you can dream of in a workstation: oscillators, pitch, filters, amp, effects, and loads of dynamic modulations. Like on the Krome, the pitch of each oscillator can be amply modulated: Temperament, key follow, multi-segment envelopes whose time and level can be modulated, two LFOs, portamento, and even AMS matrix sources (physical controllers, internal parameters or MIDI CC). The modulations themselves can be modulated by an AMS (Sidechain). Keyboard and mouse maniacs will be glad to know that the Kross has its own free editors, available both as a standalone tool or as a VST/AU plug-in for PC/ Mac (not tested by us). They run on Vista / W7 / W8 and Mac OSX (10.5 and later). The filter section features two multimode, resonant filters: two-pole low-pass, two-pole high-pass, one-pole bandpass or band-reject. They can be used in single, serial, parallel or 24 dB dual mode (the number of poles is doubled). Cut-off frequency modulations are numerous: dedicated envelope, two LFOs + global LFO, four-segment key tracking generator, and Alternate Modulation Sources (AMS). The resonance can also be modulated by AMS. Next is the amp section, whose volume and pan can be modulated. The volume can be modulated by a dedicated envelope, two LFOs, a four-segment key tracking generator, along with other AMS. At a global program level, there are some additional modulations: two global four-segment key tracking generators, one global LFO, and two AMS mixers (mix of two modulations that can be added, multiplied, offset, smoothed, morphed, quantized, or gated). In relation to Krome, the overdrive possibilities of the amp section are gone, but the basics are definitely there! The Kross inherited Krome's arpeggiator, namely, a powerful 12-voice polyphonic module, now with 64 steps (Krome is limited to 48 steps). There is one arpeggiator available for the programs and two for combinations and sequences. It allows you to create complex rhythm patterns like bass lines, funky guitar parts, synthetic riffs, or even drum groups. It provides five main patterns (up, down, alternate simple, alternate with repetition of the first and final notes, random) and 1028 user patterns (including 916 pre-loaded ones). These patterns are created in Global mode and applied to the current program, combination or sequence. For each step, you can define the pitch, velocity, Gate time and Flam (which simulates s strummed guitar). You can fix certain notes to keep them from being transposed, whatever the chord played, which is ideal to create percussion patterns. Within the programs, combinations or sequences, you'll find the playback parameters: Latch, extended (one to four octaves), resolution (in sync to the clock, from quarter-note to thirty-second note triplet), gate (0% to 100%), velocity response (global, played or per note), swing (-100% to +100%), note sorting (according to the way they were played or the pitch), keyboard mode (arpeggiated notes played alone or in addition to the original notes), activation range (low and high notes). You can control the arpeggios via MIDI with an external keyboard or arpeggiate a MIDI synth/module with the arpeggios produced by Kross. In short, there's not much to add, except that it deserves a good round of applause. Just like on the more expensive Korg workstations, Kross allows you to play a track of percussion patterns controlling a Drum Kit, which is synced (or not) to whatever is happening in the device: The Drum Track. It is available in the programs (second channel), combinations (channel 16) or sequences (track 16). You can choose the pattern from a list of 700 presets common to the Song patterns of the MIDI sequencer. The pattern can be triggered as soon as you press a key, benefiting from the Latch mode. Just like with the arpeggiator, you can define the activation zone of the Drum Track and the velocity (defined by the starting note). But where Kross goes a bit further is in the possibility of creating your own percussion patterns with the help of its Step Sequencer. Patterns are 12-voice polyphonic (up to 12 different percussion sounds) with 64 steps, and they are saved within the programs, combinations or sequences. Programming is done with an illuminated grid (like on a TR Roland or an Electribe) with the 16 program-selection buttons and the four bank buttons. The screen displays a graphical grid representing the pattern. Once again, you can enter velocity, swing and accents to fine-tune the rhythmic pattern. 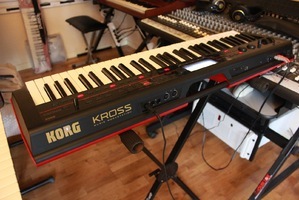 The Kross partially inherited the great effects tradition of the Korg workstations. A bit less beefy than the Krome, it provides seven multi-effects, regardless of the operating mode: five insert multi-effects (IFX) and two master multi-effects (MFX); that means, the global multi-effect and one third of the algorithms are gone. However, it does have the same real-time routing and modulation possibilities, as well as the graphical editing, which is very useful to organize the sends/returns. Keeping up with the vintage trend, the Kross includes algorithms modeled after famous brands, and developed initially for the Kronos. Thus, you have vintage phasers, flangers, chorus, ensembles, wah wahs, and compressors imitating Vox, EH, Black, Orange, Red, and Korg (Polysix) effects. And don't forget a whole array of decimators, dynamics processors, vocoders, EQ, filters, distortions, delays, reverbs, all of which can be used alone or chained in series and/or in parallel. Among the 134 algorithms available, there are 14 that are more powerful and use twice the resources (two effects slots). Algorithms have numerous parameters — between 5 and 25, approximately — but more than 10 on average. Modulations can be applied either via MIDI time sync or dynamic modulation (D-Mod). Certain effects, such as the limiter, gate or vocoder, feature stereo sidechains to be modulated by another signal. Regarding effects routing, Kross follows the tradition begun by Trinity and confirmed by Triton: You can either chain the IFX or place them in parallel in pairs. In combination or sequence mode, each channel/track can be routed to any of the five IFX, with the possibility of cascading effects according to the routing point. At the same time, each channel/track has two adjustable sends for each MFX placed on the master buses. The quality is at the same level as the quantity, which means that the Kross benefits from a quarter of a century of know-how in terms of effects on Korg workstations, ever since the M1. Despite being an entry-level workstation, the Kross is uncompromising in the assembly of its programs, far beyond what any competitor offers in this price range. It preserves the same 16-channel multi-timbral nature as Krome, keeping the Drum Track (MIDI channel to be specified), the two polyphonic arpeggiators (A and B, which can be assigned to any channel, at will and without any limits), and adding the Step Sequencer (active or not on channel 16). 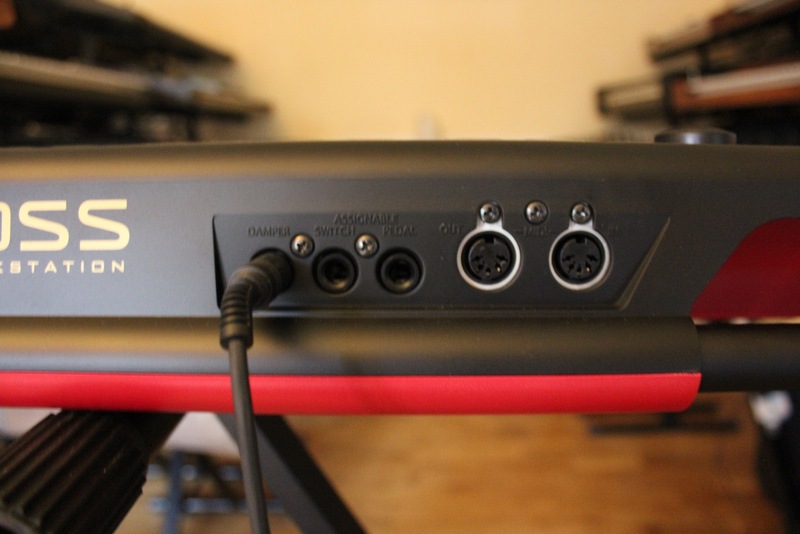 All 16 channels can be managed both by receiving (internal sound assignation) and transmitting (external MIDI channel assignation) data, which makes Kross an excellent master keyboard with 16 independent zones for transmitting (key range, velocity range, individual MIDI channels). 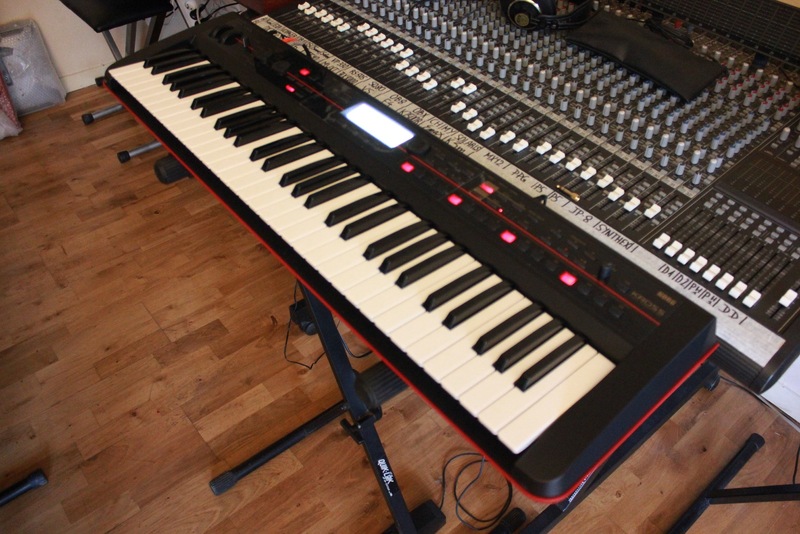 Additionally, the 88-weighted-key model is a serious and very affordable candidate to control an entire complex MIDI installation, especially live. The simultaneous visualization of 16 channels isn't as complete nor graphical as on the Krome or Kronos, but that's one of the rare concessions made in this mode. You can access, for each channel, the settings that have become a standard for Korg: program category, origin (internal/external), MIDI channel, playing mode (mono/poly/legato/one or two oscillators), volume, panorama, transposition, tuning, temperament, key range (including bottom and top limits), velocity range (with limits as well), and delay. Program editing within the combinations context is done via a dedicated "Tone Adjust" page, which allows you to take control of eight essential synthesis parameters: filter(s) cut-off frequency or frequencies, resonance(s), filter envelope intensity, velocity to amplitude, and ADSR (filter and amplitude envelopes controlled together). Everything is stored within the combinations, an alternative to the full editing of programs in their combination context, incorporated by Korg ever since the 01/W. You can filter certain MIDI controls (Program Change, Aftertouch, Sustain pedal, portamento, wheels, switches, pedals, CC…). You can also set the routing to the five insert effects and the sends to the two master effects. And don't forget the settings and the assignation towards the external signal effects buses, which are returned via one (of the two!) audio input of the Kross! 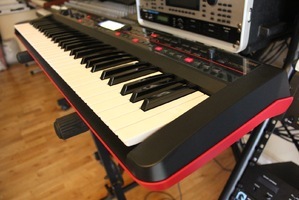 The Kross definitely earns its workstation classification thanks to its powerful built-in MIDI sequencer. Once again, no compromises here, except for the lack of graphical and touch-screen editing of its more expensive siblings. The way the sequencer works is analogous to the combination mode: 16 MIDI in/out tracks (+ tempo track), one Drum Track, two arpeggiators, one Step Sequencer, five IFX, and two MFX. And don't forget the dynamic modulation of synthesis and effects parameters, as well as the possibility to adjust several (rare) program parameters. 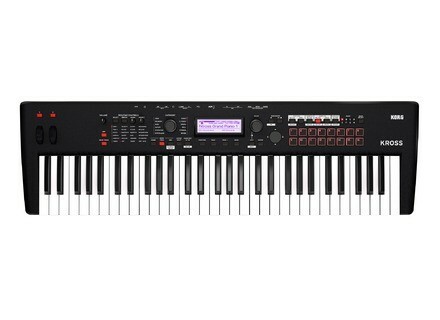 The sequencer has a capacity of 210,000 MIDI events for up to 128 Songs, with a resolution of 480 parts per quarter. The memory is RAM type, something you will eventually get used to. The Auto Song Setup function allows you to create a sequence from a program or combination by automatically assigning all original settings (programs, arpeggios, effects…). 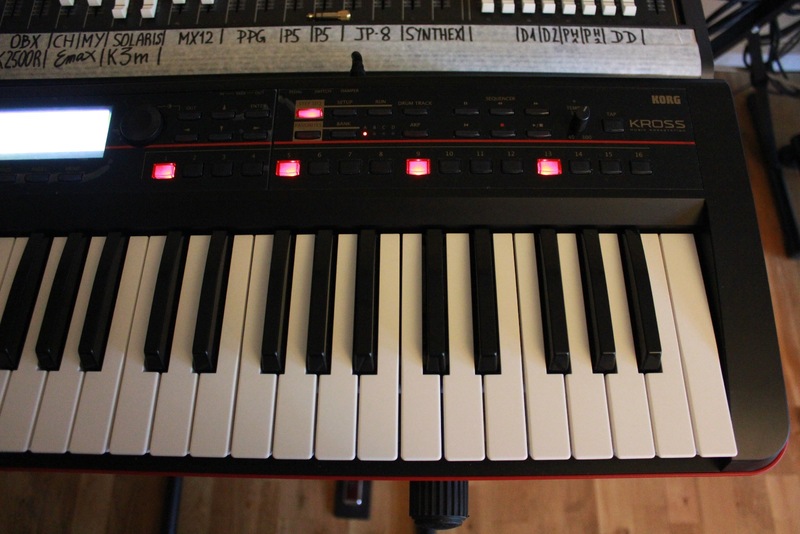 Korg has provided Kross with pre-set templates, so you don't have to start from scratch: 16 in ROM, 16 in RAM. In playback mode there's a function that allows you to play back loops of certain bars independently for each track. 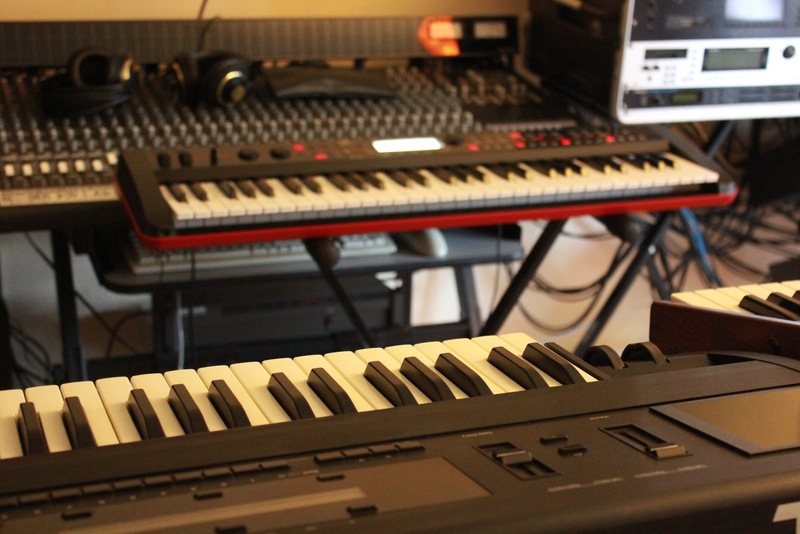 Regarding editing, all features of previous Korg workstations are there: cut, copy, paste, move, insert, delete, both for tracks and events (microscopic editing by list). 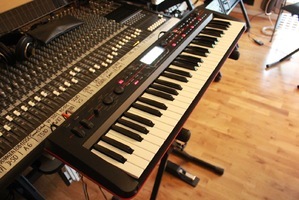 However, there's no touch-screen editing to drag-and-drop, nor the Krome Piano Roll /percussion grid modes. The basics have been preserved, though. The Kross can export and import SMF, just like its bigger siblings. The sequencer can also record Sysex, including GM, XG and GS standards. The built-in audio recorder allows you to immortalize your own performances, be it with the Kross alone or together with external audio signals, via the stereo audio line or mic (mono + gain) inputs. To that end, it uses the SD card reader with instantaneous audio recording (no need to save). 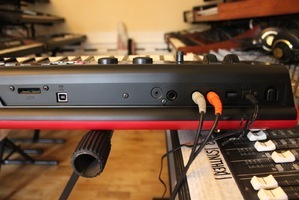 The external signal can go through the effects (IFX and MFX), including the integrated vocoder. 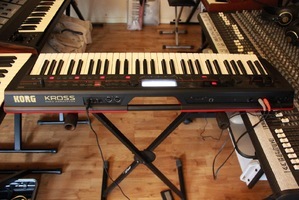 The Kross works with an internal resolution and sampling rate of 16 bits/48 kHz. With 200 audio songs of three hours each, maximum (depending on the SD card used), you are in for some fun. 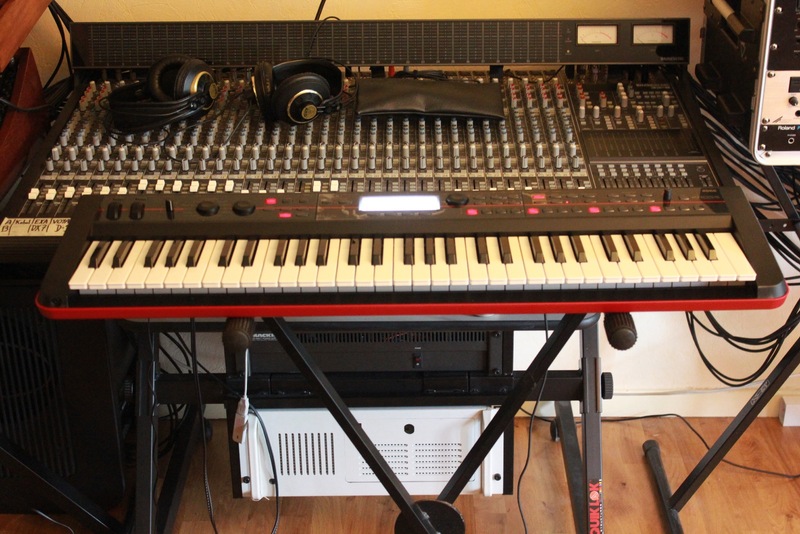 The recording can be triggered in different ways: key press, sequencer play key or audio threshold (weak or high). You can record multiple takes per song with Undo/Redo functions to switch from one take to the other. You can also do overdubs, mixing previously recorded audio to the current performance. Another application is the recording of successive takes with the possibility to send everything to your DAW to assemble a multitrack recording with Time Code preservation. Exports are made as stereo WAV files at 16 bits/48 kHz. Likewise, the Kross can import stereo WAV files at 16 bits/44 kHz or 48 kHz. An interesting module, indeed! The Kross is affordable, easy to transport and self-powered (batteries), and offers a full-fledged workstation feature set including 16-channel combinations, capabilities as a 16-part master keyboard, seven multi-effects, two polyphonic arpeggiators, and an uncompromising 16-track MIDI sequencer. Plus, some well thought-out bonuses like the fast split/layer functions, the Step Sequencer (Drum Grid would've been a more appropriate name), vocoder (with mic/line inputs), and the audio recorder. The compromises made, especially in terms of ROM, sound layers, the quality of the squishy keyboard (on the 61-key model), and the small screen, which does have an effect on the usability, given the abundance of functions. But when you look at the label, it can surely appeal to not-so-wealthy musicians or those who play live a lot and who want an autonomous and versatile keyboard or a complement to more typical synths.